Preview images and guest cast list for the Madam Secretary episode "The New Normal"
“The New Normal” is the title of the March 17 episode of Madam Secretary on CBS, and in it, when a super typhoon threatens a small Pacific island, Elizabeth tries to relocate its population before the storm makes landfall. Also, Henry gives a speech to an evangelical group about climate change. "The New Normal" -- When a super typhoon threatens a small Pacific island, Elizabeth tries to relocate its population before the storm makes landfall. Also, Henry gives a speech to an evangelical group about climate change, on MADAM SECRETARY, Sunday, March 17 (10:00-11:00 PM, ET/PT) on the CBS Television Network. 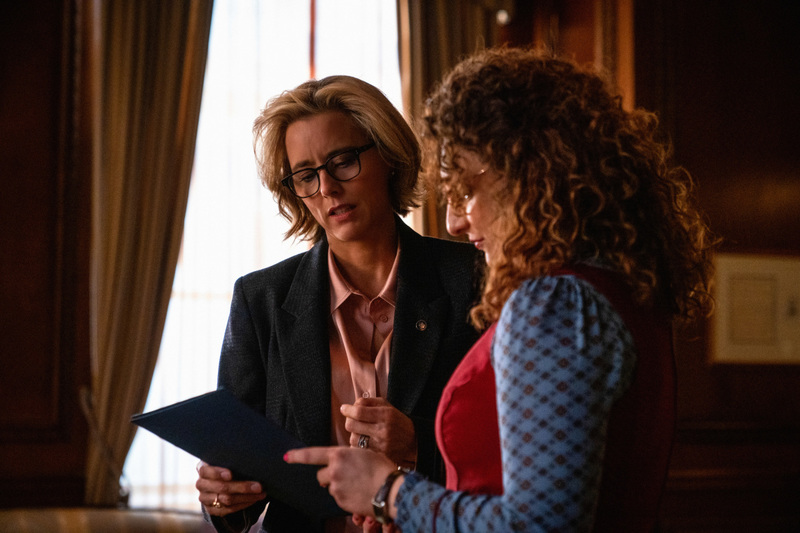 Pictured (L-R) TÃÂ©a Leoni as Elizabeth Adams McCord and Tracee Chimo Pallero as Nina Cummings Photo: Michael Parmelee/CBS ÃÂ©2019 CBS Broadcasting Inc. All Rights Reserved. Guest stars in the episode include Kevin Rahm (Michael “Mike B.” Barrow) and Mandy Gonzalez (Lucy Knox). Additional guest stars in “The New Normal” are Tracee Chimo Pallero (Nina Cummings), Matthew Schmidt (Pilot), Hassiem Muhammad (Co-Pilot), Sandra Daley (Adele Steele), Erica Hernandez (Tech 1), Yonatan Gebeyehu (Tech 2), John Pankow (Glenn, NASA Administrator), Tai Hara (David Akua), Jim True-Frost (Pastor Eli Bragg), Lilli Kay (Ruby Bragg), Constantine Maroulis (Bryce Manley), Henny Russell (Candice), Mark Epperson (TV Host), Marva Hicks (Chief Clerk), and Martin Van Treuren (Senate President). Nice try about pushing the “global warming” farce. Didn’t work. Try checking facts, not those paid for by the far left. Still enjoy the family aspect of the show. Guess you can attempt to force the left’s fiction, but why try? To “outdooegrams” and “Tom” – Are you kidding? Talk about burying your head in the sand of denial! This show again talks about very real issues we are ALL facing. Pay attention to reality!! for once, a heartfelt moment i could identify with: when Sec McC counsels Mike B to let Gordon cross the rainbow bridge with dignity. Please do not listen to Mr. McCord and his writers on theology. Christianity has nothing to do with “saving” planet Earth in the way they portray. There will be a new heavens and a new earth. This one will be judged by fire. Stewardship in a pre-fall world cannot be applied in the same way to a cursed world. Once again Hollywood has no idea how to interpret or apply Jesus’ words. They just want to believe what sin-cursed scientists tell them. I wondered what kind of folks would comment on a series episode description… my answer here. Can there really be so little capacity to seek out science, fact and sound public policy? Caroline, Science is often dogma masquerading as “fact”. When you choose to look deeper you will find that most scientific positions are based on unfounded beliefs supported by unprovable assumptions. No scientists have even close to all the data to have total understanding, and so must operate on faith of some sort. I choose to put my faith in God and not in fallen humanity. But, if you choose to put your faith in scientists (not science), based on their fallible perceptions and pre-conceptions, you’ve been given free will. After this far left agenda driven episode, we will no longer be watching…. Stopped watching Madame Secretary, which used to be my favorite show after Homeland, as every episode started to push a far left agenda. It was no longer entertainment, just more left wing propaganda. I’m sure their ratings have dropped drastically.